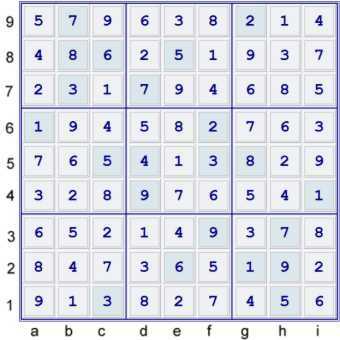 The Tough Sudoku of February 24, 2011 is a potentially instructive Sudoku puzzle. In this particular puzzle, using the fact that the puzzle has exactly one solution can serve to shorten the solution path. 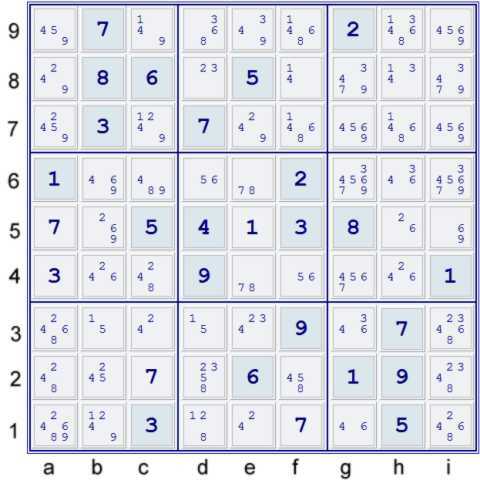 Uniqueness is a slightly controversial, but certainly powerful Sudoku technique, trick or tip. This blog page presumes that the reader is familiar with most easy sudoku techniques. 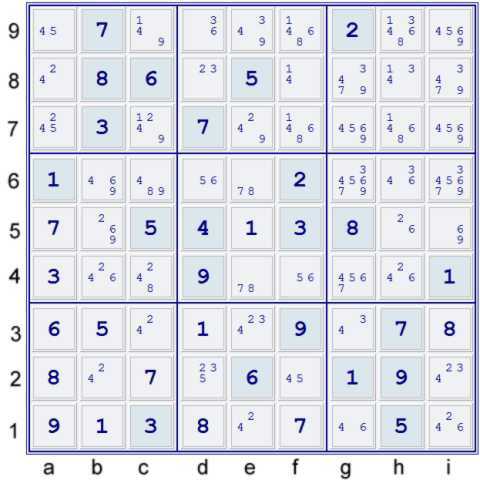 I will not list any of the steps which are part of the Simple Sudoku Technique Set - SSTS. 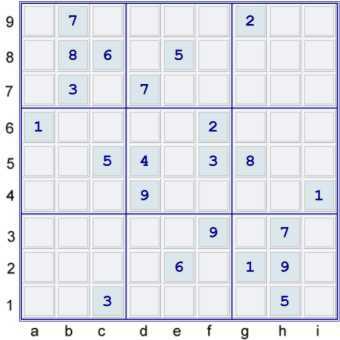 Simple Sudoku can find no further deductions to make at this point. The puzzle with pencil marks (also called possibilities) is shown below. Puzzle at UP 24 and initial SSTS - a simple Unique Rectangle avoidance deduction. Note that most of the things I show later are available already below. Note that the list of steps I find here is not exhaustive. I find it helpful to brainstorm a bit with a puzzle. I simply look for a collection of steps or partial steps that are available. This often reveals a way to significantly advance the puzzle. AUR(26)bh45 => (4)bh4 = (9)b5. There are a few more, but their SIS's (Strong Inference Sets) are not as easily managed. The MUG(246), Multivalue Unique Grave, - can be seen as at least one of several possible BUG lites. That is not my preferred manner of proof, but it does suffice. Although these loops do not really knock out the puzzle, they imply that solving any candidate in the bottom three boxes will significantly advance the puzzle. Exactly one triplet(246)b456,h456 is true. It should be obvious that using g4, one can elminate(9)b1. The step below is, imo, easier than the YWing. It should be fairly automatic for good solvers to find the WWing below. SSTS finishes the puzzle from there. I look forward to reading some of the creative solutions that the clever solvers on the tough page will put forth for this puzzle!